روشنی, مجید, میری, سیدضیاالدین, اشجعی, مهدی, حنفی‌زاده, پدرام, افتخاری نسب, افشین. (1393). بررسی عملکرد حرارتی و هیدرودینامیکی جریان جت برخوردی نانوسیال آب- Al2O3 در چاه حرارتی صفحه- پینی. نشریه پژوهشی مهندسی مکانیک ایران, 16(2), 60-89. مجید روشنی; سیدضیاالدین میری; مهدی اشجعی; پدرام حنفی‌زاده; افشین افتخاری نسب. "بررسی عملکرد حرارتی و هیدرودینامیکی جریان جت برخوردی نانوسیال آب- Al2O3 در چاه حرارتی صفحه- پینی". نشریه پژوهشی مهندسی مکانیک ایران, 16, 2, 1393, 60-89. روشنی, مجید, میری, سیدضیاالدین, اشجعی, مهدی, حنفی‌زاده, پدرام, افتخاری نسب, افشین. (1393). 'بررسی عملکرد حرارتی و هیدرودینامیکی جریان جت برخوردی نانوسیال آب- Al2O3 در چاه حرارتی صفحه- پینی', نشریه پژوهشی مهندسی مکانیک ایران, 16(2), pp. 60-89. روشنی, مجید, میری, سیدضیاالدین, اشجعی, مهدی, حنفی‌زاده, پدرام, افتخاری نسب, افشین. بررسی عملکرد حرارتی و هیدرودینامیکی جریان جت برخوردی نانوسیال آب- Al2O3 در چاه حرارتی صفحه- پینی. نشریه پژوهشی مهندسی مکانیک ایران, 1393; 16(2): 60-89. در این پژوهش، عملکرد هیدرودینامیکی و مشخصات انتقال‌حرارت نانو‌سیال آلومینا در چاه‌حرارتی مینیاتوری صفحه-‌ پینی بصورت عددی و آزمایشگاهی مورد بررسی قرار‌گرفت. چاه حرارتی از جنس آلومینیوم با دستگاه CNC ساخته و در محفظه‌ی پلکسی‌گلاس تعبیه شد. شار حرارتی ثابت kW/m2 125 به کف چاه حرارتی وارد گردید. محدوده عدد رینولدز بین 9/156 و 25/589 می‌باشد. چاه حرارتی به صورت سه بعدی مدل شد و با حل انتقال‌حرارت مماسی در آن خواص هیدرودینامیکی و انتقال‌حرارت مورد بررسی قرار‌گرفت. نتایج حاکی از آن است که افزایش غلظت حجمی نانوسیال آلومینا از 5/0 تا 2 درصد و افزایش عدد رینولدز باعث افزایش ضریب انتقال‌حرارت جابجایی، کاهش مقاومت حرارتی، یکنواختی ‌دمایی کف چاه‌حرارتی، افزایش عدد ناسلت و افزایش توان پمپاژ نانوسیال نسبت به سیال پایه می‌شود. Chin, S.B., Foo, J. J., Lai, Y. L., and Yong, T. K. K., "Forced Convective Heat Transfer Enhancement with Perforated Pin Fins", Heat and Mass Transfer, Vol. 49, pp. 1447-1458, (2013). Jasperson, B.A., Jeon, Y., Turner, K.T., Pfefferkorn, F.E., and Qu, W., "Comparison of Micro-pin-fin and Microchannel Heat Sinks Considering Thermal-hydraulic Performance and Manufacturability", Components and Packaging Technologies, IEEE Transactions on, Vol. 33, pp. 148-160, (2010). Ryu, H.C., Kim, D., and Kim, S.J., "Experimental Analysis of Shrouded Pin Fin Heat Sinks for Electronic Equipment Cooling", in Thermal and Thermomechanical Phenomena in Electronic Systems, 2002. ITHERM 2002. The Eighth Intersociety Conference on, pp. 261-266, San Diego, California, USA, (2002). Jung, H.H., and Maveety, J.G., "Pin-fin Heat Sink Modeling and Characterization", in Semiconductor Thermal Measurement and Management Symposium, 2000. Sixteenth Annual IEEE, pp. 260-265, San Jose, CA, USA, (2000). Rizzi, M., Canino, M., Hu, K., Jones, S., Travkin, V., and Catton, I., "Experimental Investigation of Pin Fin Heat Sink Effectiveness", Proceedings of ASME NHTC, Vol. 1, pp. 10-12, Anaheim, CA, USA, (2001). Kosar, A., and Peles, Y., "TCPT-2006-096. R2: Micro Scale Pin Fin Heat Sinks—Parametric Performance Evaluation Study", Components and Packaging Technologies, IEEE Transactions on, Vol. 30, pp. 855-865, (2007). Ho, A. 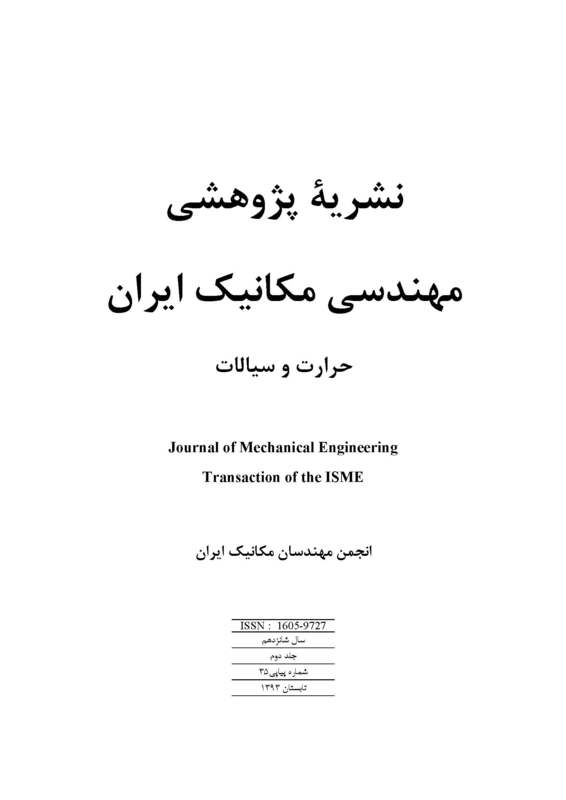 M.S., Qu, W., and Pfefferkorn, F., "Pressure Drop and Heat Transfer in a Single-Phase Micro-pin-fin Heat Sink", in ASME International Mechanical Engineering Congress and Exposition, (2006). Sahiti, N., Lemouedda, A., Stojkovic, D., Durst, F., and Franz, E., "Performance Comparison of Pin Fin Induct Flow Arrays with Various Pin Cross-sections", Applied Thermal Engineering, Vol. 26, pp. 1176-1192, (2006). Yakut, K., Alemdaroglu, N., Kotcioglu, I., and Celik, C., "Experimental Investigation of Thermal Resistance of a Heat Sink with Hexagonal Fins", Applied Thermal Engineering, Vol. 26, No. 17, pp. 2262-2271, (2006). Naphon, P., and Khonseur, O., "Study on the Convective Heat Transfer and Pressure Drop in the Micro-channel Heat Sink", International Communications in Heat and Mass Transfer, Vol. 36, No. 1, pp. 39-44, (2009). Naphon, P., Klangchart, S., and Wongwises, S., "Numerical Investigation on the Heat Transfer and Flow in the Mini-fin Heat Sink for CPU", International Communications in Heat and Mass Transfer, Vol. 36, No. 8, pp. 834-840, (2009). Jeng, T. M., Tzeng, S. C., and Liao, H. R., "Flow Visualizations and Heat Transfer Measurements for a Rotating Pin-fin Heat Sink with a Circular Impinging Jet", International Journal of Heat and Mass Transfer, Vol. 52, No.7, pp. 2119-2131, (2009). Yang, Y. T., and Peng, H. S., "Investigation of Planted Pin Fins for Heat Transfer Enhancement in Plate Fin Heat Sink", Microelectronics Reliability, Vol. 49, No. 2, 163-169, (2009). Khan, W. A., Culham, J. R., and Yovanovich, M. M., "The Role of Fin Geometry in Heat Sink Performance", Journal of Electronic Packaging, Vol. 128, No. 4, pp. 324-330, (2006). Sivasankaran, H., Asirvatham, G., Bose, J., and Albert, B., "Experimental Analysis of Parallel Plate and Crosscut Pin Fin Heat Sinks for Electronic Cooling Applications", Thermal Science, Vol. 14, No. 1, pp. 147-156, (2010). Mital, M., "Analytical Analysis of Heat Transfer and Pumping Power of Laminar Nanofluid Developing Flow in Microchannels", Applied Thermal Engineering, Vol. 50, No. 1, pp. 429-436, (2012). Hung, T. C., Yan, W. M., Wang, X. D., and Chang, C. Y., "Heat Transfer Enhancement in Microchannel Heat Sinks using Nanofluids", International Journal of Heat and Mass Transfer, Vol. 55, No.9, pp. 2559-2570, (2012). Naphon, P., and Nakharintr, L., "Heat Transfer of Nanofluids in the Mini-rectangular Fin Heat Sinks", International Communications in Heat and Mass Transfer, Vol. 40, pp. 25-31, (2012). Selvakumar, P., and Suresh, S., "Convective Performance of CuO/Water Nanofluid in an Electronic Heat Sink", Experimental Thermal and Fluid Science, Vol. 40, pp. 57-63, (2012). Zhou, M., Xia, G., Chai, L., Li, J., and Zhou, L., "Analysis of Flow and Heat Transfer Characteristics of Micro-pin Fin Heat Sink using Silver Nanofluids", Science China Technological Sciences, Vol. 55, No. 1, pp. 155-162, (2012). Choi, S. U., and Eastman, J. A., "Enhancing Thermal Conductivity of Fluids with Nanoparticles (No. ANL/MSD/CP--84938; CONF-951135--29)", Argonne National Lab., IL (United States), (1995). Corcione, M., "Empirical Correlating Equations for Predicting the Effective Thermal Conductivity and Dynamic Viscosity of Nanofluids", Energy Conversion and Management, Vol. 52, No. 1, pp. 789-793, (2011). Jung, J. Y., and Yoo, J. Y., "Thermal Conductivity Enhancement of Nanofluids in Conjunction with Electrical Double Layer (EDL)", International Journal of Heat and Mass Transfer, Vol. 52, No. 1, pp. 525-528, (2009). Mintsa, H. A., Roy, G., Nguyen, C. T., and Doucet, D., "New Temperature Dependent Thermal Conductivity Data for Water-based Nanofluids", International Journal of Thermal Sciences, Vol. 48, No. 2, pp. 363-371, (2009). Chon, C. H., Kihm, K. D., Lee, S. P., and Choi, S. U., "Empirical Correlation Finding the Role of Temperature and Particle Size for Nanofluid (Al2O3) Thermal Conductivity Enhancement", Applied Physics Letters, Vol. 87, No. 15, pp. 153107-153107, (2005). Duangthongsuk, W., and Wongwises, S., "Measurement of Temperature-dependent Thermal Conductivity and Viscosity of TiO2-water Nanofluids", Experimental Thermal and Fluid Science, Vol. 33, No. 4, pp. 706-714, (2009). Reddy, M., and Rao, V.V., "Experimental Studies on Thermal Conductivity of Blends of Ethylene Glycol- water Based TiO2 Nanofluids", International Communications in Heat and Mass Transfer, Vol. 46, pp. 31-36, (2013). Murshed, S. M. S., Leong, K. C., and Yang, C., "A Combined Model for the Effective Thermal Conductivity of Nanofluids", Applied Thermal Engineering, Vol. 29, No. 11, pp. 2477-2483, (2009). Agarwal, A., "Heat Transfer and Pressure Drop During Condensation of Refrigerants in Microchannels", Ph.D. Dissertation, Georgia Institute of Technology, Mechanical Engineering, (2006). Determan, M., "Thermally Activated Miniaturized Cooling System", Ph.D. Dissertation, Georgia Institute of Technology, Mechanical Engineering, (2008). Dang, B., "Integrated Input/output Interconnection and Packaging for GSI", Ph.D. Dissertation, Georgia Institute of Technology, Electrical and Computer Engineering, (2006). Wei, X., "Stacked Microchannel Heat Sinks for Liquid Cooling of Microelectronics devices", Ph.D. Dissertation, Georgia Institute of Technology, Mechanical Engineering, (2004). Koo, J., and Kleinstreuer, C., "A New Thermal Conductivity Model for Nanofluids", Journal of Nanoparticle Research, Vol. 6, No. 6, pp. 577-588, (2004). Pak, B. C., and Cho, Y. I., "Hydrodynamic and Heat Transfer Study of Dispersed Fluids With Submicron Metallic Oxide Particles", Experimental Heat Transfer an International Journal, Vol. 11, No. 2, pp. 151-170, (1998). Xuan, Y., and Roetzel, W., "Conceptions for Heat Transfer Correlation of Nanofluids", International Journal of Heat and Mass Transfer, Vol. 43, No. 19, pp. 3701-3707, (2000). Brinkman, H. C., "The Viscosity of Concentrated Suspensions and Solutions", The Journal of Chemical Physics, Vol. 20, pp. 571-571, (1952). Einstein, A., "A New Determination of Molecular Dimensions", Ann. Phys, Vol. 19, No. 2, pp. 289-306, (1906). Hamilton, R. L., and Crosser, O. K., "Thermal Conductivity of Heterogeneous Two-Component Systems", Industrial and Engineering Chemistry Fundamentals, Vol.1, No. 3, pp. 187-191, (1962). Wasp, E. J., Kenny, J. P., and Gandhi, R. L., "Solid–liquid Slurry Pipeline Transportation, Series on Bulk Material Handling", Trans. Tech. Publications, USA, (1977). م. ﻣﻘﺪﻣﻲ، م. ر. دﻫﻜﺮدی، "ﺑﺮرﺳﻲ ﻋﺪدی ﺿﺮاﻳﺐ اﻧﺘﻘﺎل ﺣﺮارت و اﻓﺖ ﻓﺸﺎر ﺑﺮای ناﻧﻮﺳﻴﺎﻻت ﻣﺨﺘﻠﻒ در ﺟﺮﻳﺎن های آرام و درﻫﻢ"، ﭘﺎﻳﺎن ﻧﺎﻣﻪ‌ی ﻛﺎرﺷﻨﺎﺳﻲ ارﺷﺪ، داﻧﺸﻜﺪه مکانیک، داﻧﺸﮕﺎه ﺗﻬﺮان، (1387). Seyf, H. R., and Feizbakhshi, M., "Computational Analysis of Nanofluid Effects on Convective Heat Transfer Enhancement of Micro-pin-fin Heat Sinks", International Journal of Thermal Sciences, Vol. 58, pp. 168-179, (2012). Kwak, H. S., Kim, H., Hyun, J. M., and Song, T. H., "Thermal Control of Electroosmotic Flow in a Microchannel through Temperature-dependent Properties", Journal of Colloid and Interface Science, Vol. 335, No. 1, pp. 123-129, (2009). Maga, S. E. B., Nguyen, C. T., Galanis, N., and Roy, G., "Heat Transfer Behaviours of Nanofluids in a Uniformly Heated Tube", Superlattices and Microstructures, Vol. 35, No. 3, pp. 543-557, (2004). Li, J., and Kleinstreuer, C., "Thermal Performance of Nanofluid Flow in Microchannels", International Journal of Heat and Fluid Flow, Vol. 29, No. 4, pp. 1221-1232, (2008).